Where did you undertake your thesis research? My PhD research was based at the department of Clinical Science and Engineering, Salisbury District Hospital. The department focuses on the engineering aspects of patient care, in particular Rehabilitation and Biomedical Engineering. The PhD project was a result of collaboration between Bournemouth University, Salisbury District Hospital and Odstock Medical Ltd.
My thesis details the development of a neural prosthesis used to improve and regain the function of upper and lower limbs for people with neurological impairment. 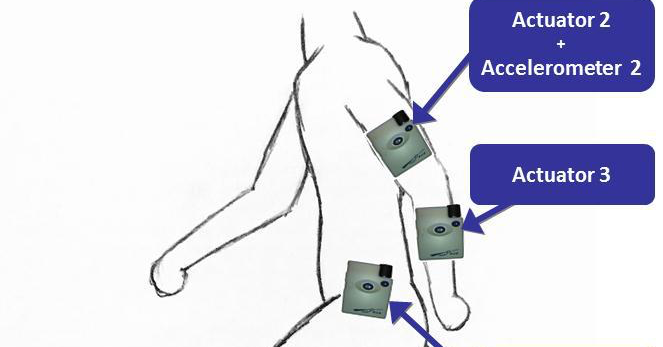 The device consists of three actuators generating Functional Electrical Stimulation (FES) and four sensors used to enable/disable the actuators. The first part of the research project involved investigating the use of a wireless body-centric network between sensors and actuators to minimise wires and therefore improve practicality and ease of use. The wireless network also allows expandability and removes the need for redundant sensors. The second part consisted of developing a control philosophy that uses sensory data in real-time to enable stimulation only when needed. In order to detect the necessary events, the thesis compared various types of sensors in terms of accuracy and complexity including kinematic sensors and pressure sensors. My interest in the field of biomedical signal processing started during my MSc at Oxford Brookes University where I undertook Digital Signal Processing (DSP) modules taught by Prof. Chris McLeod who specialises in medical signal processing. This inspired me to undertake research in this field and apply for this PhD project. Neurological diseases and injuries affect hundreds of thousands of people each year. Stroke is one of the major causes which often results in weakness or paralysis of limbs on the same side of the body, i.e. hemiplegia. These effects cause permanent disabilities in many cases. Functional Electrical Stimulation (FES) has been increasingly accepted as a treatment of such conditions which helps restore and assist movement in upper and lower limbs. However, current FES systems designed for more than one muscle group (i.e. multi-channel stimulators) suffer from some practical limitations in functional use. Some of these limitations are the bulkiness of these devices and the long wires between stimulator unit and sensors/electrodes. Moreover, upper limb FES systems are usually independent from lower limb FES systems although both upper and lower limbs are involved at the same time in some tasks such as walking. Improving gait patterns of hemiplegics requires FES assistance on both lower and upper limbs for foot clearance from the ground and arm swing. Some of the issues mentioned above can be addressed by new designs of FES systems, which are distributed and wirelessly connected. Hemiplegia also affects the ability to reach and grab objects using the arm on the affected side. FES of the upper limb is used to help patients reach and grab for objects by applying stimulation on the muscles responsible for elbow extension and hand/wrist opening. Combining this application with walking FES in the same system, would be beneficial for hemiplegics and can make them independent in their daily tasks. 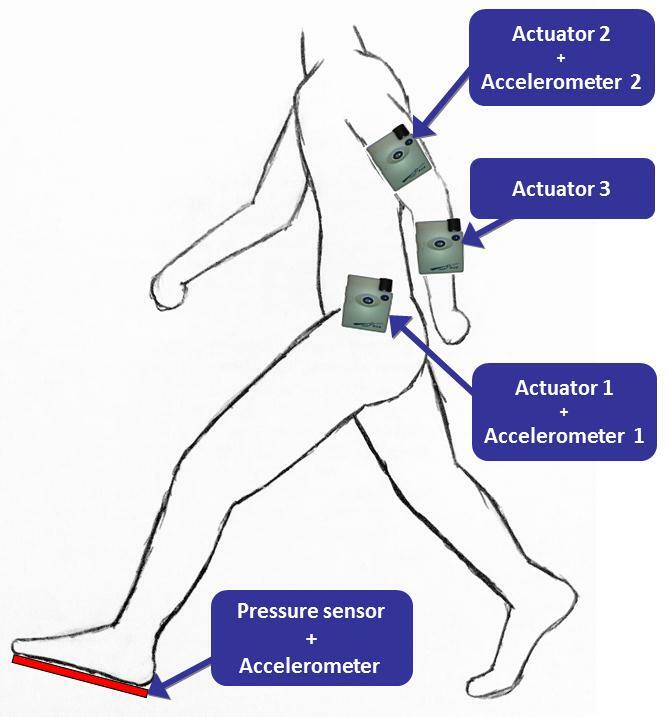 This research therefore developed a system that can detect whether the user is walking, to enable stimulation for foot clearance and arm swing when walking and enables reaching stimulation only when stationary. This thesis investigated the use of wireless body-centric networks for FES involving real-time control based on wireless sensory data. The findings suggest that ZigBee was the most suitable off-the-shelf wireless technology compared to other personal area networks (including Bluetooth and Wi-Fi). Findings also show that ZigBee has a reliability of more than 99% for transmission latencies less than 100ms which was acceptable for this application. This body-centric network configuration using ZigBee, developed for this PhD project, can be applied on all multi-channel FES systems and can be generalised to any application involving wireless body sensing and multiple actuators. The thesis also described the design and experimentation of a control philosophy for a three-channel FES system used to correct foot drop and arm swing while walking and helps reaching and grabbing objects when stationary. This system showed high reliability and repeatability which is encouraging to develop the system into an easy to use and wear system for hemiplegics to assist them in their daily activities. Dr Choukri Mecheraoui graduated as an electronics engineer from l'Ecole National Polytechnique d'Alger and holds an MSc in wireless communication systems from Oxford Brookes University. He obtained his PhD in Electrical and Electronic Engineering from Bournemouth University in 2012. His research interest focuses on digital signal processing and wireless body-centric networks in medical applications.